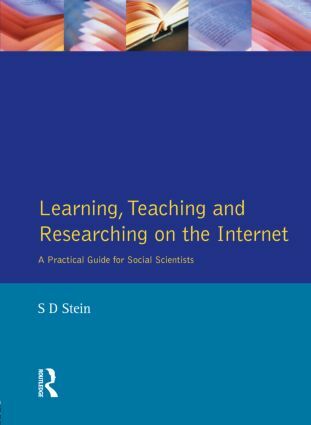 Learning, Teaching and Researching on the Internet: A Practical Guide for Social Scientists is directed at students and academic staff who want to be able to access Internet resources quickly and efficiently without needing to become IT experts. The emphasis throughout is on the harnessing of the large volume of potentially useful Internet resources to everyday requirements, whether these be focused on learning, teaching or research. The Internet is a significantly rich information, communication and research resource for all those involved in higher education, whether they be students, academic staff involved in teaching and research, or educational administrators. Whilst the author has drawn on the large volume of technical literature, it is written on the basis of practical experience acquired over the many years of using Internet resources in the context of teaching undergraduate and postgraduate courses in the social sciences. In addition to extensive coverage on using Web browsers, searching for information at Web sites, in mailing lists and newsgroups, Part IV provides detailed annotations in the resources available at the best sites on the Internet collating materials on politics, sociology, economics, philosophy, psychology, history, human rights, European Union and other categories. The work is structured so that it will be found useful by both beginners and intermediate level users. Wide Area Networks and the Internet. Working the Net with the Browser. 6. Search Engines and Searches. 10. Mailing List Commands and Exchanges. 12. Reading the News: Newsgroups. 14. Electronic Texts and Reviews. Treaties, Declarations and Other Instruments. Human Rights in Particular Countries. United Nations and Human Rights. 21. Philosophy, Sociology and Psychology. 22. Political Science and Government. 26. Additional Techniques, Applications and Resources.